Careful girls, or one of those things might bite you! 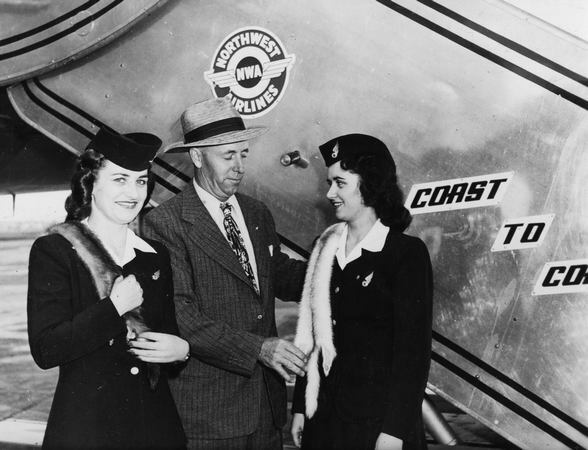 The above Northwest Airlines uniforms are navy blue with airplane emblazoned buttons. Oh, and a mink scarf. Geoff Nunn, exhibits developer for the second Style in the Aisle exhibit at Seattle's Museum of Flight, explains that the mink was an effort to upstage PanAm, whose stewardesses had begun wearing pearls. It seems Northwest had just opened up transcontinental routes and was about to be awarded international routes, putting them in direct competition with PanAm. Ergo, escalating adornments. Reality check: "We're not entirely sure, but we suspect that they actually just wore them while walking through the airport or in publicity photos," Nunn said. Minks . . . pearls . . . so mid-1940s, wouldn't you say? By my time, a mere decade later, there wasn't a mink or a pearl to be seen around either airline! "Style in the Aisle" opened Saturday, January 29 and runs through May 30, 2011 at the Museum of Flight. Mink and pearls- those were the days.